Dr. Saw-Wai Hla and Dr. Eric Masson are thrilled with their team's performance in the world's first nanocar race in April, but for them, it was a fun starting point to a much larger goal. 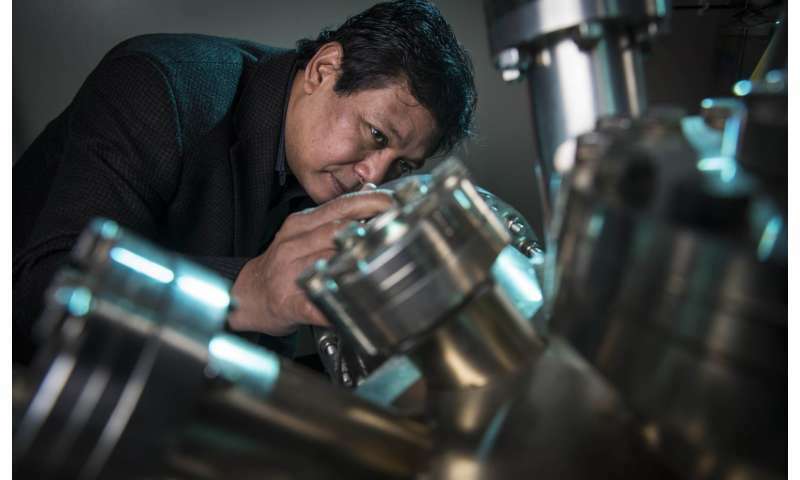 "The nanocar race is not the end; it is just the very beginning of our project," Hla, a professor of physics and astronomy, said. "We entered this competition not just to win, but to develop a controlled transport system at the molecular scale." That's the first part of the goal; the second is to help create a new field of study – quantum mechanical engineering – that is now discussed only at the early theoretical stage. The nanocar race was a unique competition: Six teams worked to build cars that could race each other on a track. However, these cars were no bigger than a few molecules, and the Ohio University team's car wasn't even in France, where the race was held; instead, it was a quarter of the way around the planet, in Hla's lab at Ohio University. Masson, an associate professor of chemistry and biochemistry, and his team built OHIO's car, known as the "Bobcat Nanowagon," then worked with Hla to get it into a solid-state "race track" made of gold. From there, Hla's team "drove" the car along a 100-nanometer track. The driving is done by applying a positive or negative electrical charge to effectively "push" or "pull" the nanocar in a given direction. Ultimately OHIO's entry covered 43 nanometers, but would have finished easily, Hla said, if not for a mundane foe: Ohio weather. A thunderstorm on the day of the race caused power issues that doomed the team – not that anyone was complaining. "This is the first time that we made atomic-level control manipulation across an ocean by remote control. That is the technology itself. This is a technical breakthrough," Hla said. The team that won, comprised of members from Rice University and Austria, also participated remotely, but from a lab in Austria, the same time zone as Toulouse, France, where the race was held. The Ohio team had to operate at six-hour time difference. Like the French team's car, the Ohio Bobcat Nanowagon fit all of the stated criteria for the competition: It had more than 100 atoms (644, in fact), and was operated on a gold surface. "Our car is the only car that looks like a car, it's functional, and it's a pure American car. It may not be the most beautiful one, but it works," Hla said. OHIO's was also the only one of the six to be a supramolecular car – it had five interlocked molecules. "Basically, it's the first supramolecular car ever designed. It is also the largest nanocar ever built," Masson said. Hla and Masson hope to create larger nanocars that can catch, move or release other molecules in a precise way, effectively building molecular structures for any number of applications. That's where the quantum mechanical engineering comes in. Hla compared it to our ordinary mechanical engineering used to design cars, buildings and other constructs. "All of those machines are in our scale; we can use the concepts that we already know from mechanical engineers. However, for nanocars that we develop or any molecular machine that we develop in nanoscale, we cannot use any of those concepts. None," Hla said. The nanocar is a good example; even though it has four wheels and moves across a surface, Hla and Masson are still working to discover if the wheels are gliding or rolling across the surface. On a nano-level, gravity is irrelevant, so the way the nanocar adheres to the surface and how it is moving across is highly important for fundamental scientific understanding. "So the attraction of the car to stick to the surface has nothing to do with gravity. It has everything to do with atomic-level interactions between that wheel and the surface," Hla said. "In the quantum regime, the energy transfer to driving the machines, everything, is completely different from our world. However, there is no subject called quantum mechanical engineering. Nobody really knows what will be the energy we need. This is a major challenge right now and a major boost in the research direction. All the funding agencies in the US and around the world are really heavily pursuing it, this year, starting from now; it's becoming very popular." The concept of molecular machines isn't new; Hla said our bodies have them, in the form of DNA making repairs on a constant basis. But there aren't many man-made ones, he said. "Especially one that is suitable to operate in solid-state devices, like iPhones or computers," he said. "…In my group at OHIO, we measure novel properties of molecular machines and try to understand them." If the nanocars can be mass-produced and controlled, particularly a lot of them at once, they can be used to build or restructure electronic circuits and data storage devices, for example. A nano-sized data storage device would revolutionize the industry. "Modern electronics today is way larger than our scale," Hla said. "The scale currently… it is still about 1 million times by area larger than ours. We can use our nanocars as data storage. You have ultra-dense data storage. Probably the entire world's information, you could put in one cell phone, for example." Or think of the scale this way: A nanocar is about eight square nanometers. The width of a human hair is about 8,000 square nanometers. Thus, about a billion nanocars would fit in that space. For now, of course, this is all in the theoretical phase. Hla and Masson said there is a lot of research and experimentation to be done. And, they said, they couldn't do it alone; their students have been active in running experiments and one, Ryan Tumbleson, even drove the "Bobcat Nanowagon" during the race. Hla said others are working on similar projects, so OHIO has to remain on the forefront. "If we don't do it, somebody else will be doing it, so we'd better lead it," he said. "Maybe one day the university will have a special department, quantum mechanical engineering." He said there's no reason Ohio University can't take the lead; in fact, he says it already has. "Don't look down because we are from OHIO; we are unique," he says. "There was only one complete group from the US that competed (in the nanocar race). We can change the world, in a good way." The technology, Hla said, can help in many ways. "There are many areas, I do believe, that will be hugely impacted. Medicine, electronics, information technology, just to name a few. Those are the real impacts. However, it has to start from somewhere."